Congratulations on your engagement! We would be delighted to be a part of your big day and help you celebrate your wedding with us at The Landing. Arrive by boat and host your ceremony in the exclusive River Garden, with Dockside’s boardwalk views of the Story Bridge offering the perfect backdrop for your wedding photography. Enjoy panoramic views of the River from The Harbour Room and The River room in our unique setting, and watch the river come to life at night. personalised tables all available in house. Directly overlooking the Brisbane River, The Harbour Room is The Landing’s signature space. With a beautiful water feature creating the perfect ambience, the room has comes to life amongst its surroundings of gardens and natural water. With capacity to host 300 guests for a seated dining event or 500 guests for a cocktail event, The Harbour Room is perfect for creating a memorable impact. Overlooking the Dockside Marina, The River Room is suitable for formal, informal, cocktail or lunchtime wedding receptions. The opulent silk lined ceiling provides a warm glow from the fairy lights that twinkle within, while the large interior serves as the perfect after dinner dance space. Capacity for seated dining for 170 guests or 400 guests for a cocktail reception. 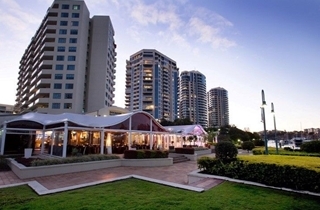 Perfect for cocktail or sit down receptions, The Garden room is nestled in amongst the beautifully landscaped gardens of the Dockside precinct and is full of natural light. This tranquil setting opens on to a private terrace for canapes, and is fully air conditioned, giving your guests plenty of space to relax. Seats 60 sit down, or 100 cocktail style. Served to the centre of the table on platters and high tea stands. 4 hour all inclusive cocktail event. An all inclusive cocktail party. 4 hour sit down reception. 5 Hour sit down reception.